That said, the graphics aren't overly detailed. Colors are extremely bright and the landscapes are of a futuristic nature, but what they most closely resemble is the animation found in the cartoon series "The Jetson's". Tons of motion capture dance moves look flawless, but there tends to be a high blur effect on most of your surroundings. It definitely looks different or beyond the norm. The grahics, in the end, are quite pleasant. Ulala basically gets sent on a mission to destroy the aliens by outdancing them. It's a simple game of mimicking your opponents moves. They will perform various moves in a variety of directions that never expand beyond up, down, left, right, A, or B. It's that simple! The Moroliens perform a dancing combination, then you try to mimic it. Doing so gains you ratings. Television ratings of course. You start with a low rating of about ten and try to work your way up to 100. If you fail, your show will be cancelled and it's game over. Also, you have the opportunity to free hostages who are under the moroliens dancing spell. Get this, Micahel Jackson makes a triumphant return to Sega in the form of Space Michael Jackson. Although his dialouge is a minimum of three words and countless Whooos, his presence does add a touch of realism to the title. 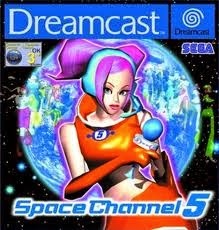 It's the soundtrack that keeps Space Channel 5 alive. The tunes are simply brilliant. It's all original, providing a thumping beat that will have even the most shy of gamers tapping their feet to the rythym. And if you don't have any rythym then you won't be able to complete this game. It's all about musical timing. I would think that most of us possess the skills to recognize basic musical patterns, but I can't speak for everyone. That's enough praise for now, let me tell you why you may want to stay away from this title. First off, the game only has four levels. That's it from top to bottom. Sure there are multiple scenario's within a mission, but the gameplay is so familiar that it's like nothing new at all. The only thing to gain from finishing the game is a ton of character profiles that are brief and almost pointless. And unless you are a totally inadequate gamer, you will finish this game in a few short hours. Possibilities of replaying this title is in your capable hands to figure out. I like to give it a whirl every once in a while because it truly is a fun game with a unique concept. But I would hardly reccomend shelling out the dough for a brand new copy of this title. It's a one player game with it's longevity being it's only real flaw. Perhaps a four player option would have added to the fun. This is Sega Dreamcast game.